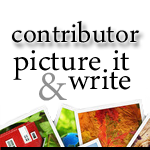 Picture It and Write is a weekly writing challenge, posted every Sunday by Eliabeth, the author of Ermiliablog. The challenge is to write a piece of fiction or a poem in response to the photo prompt supplied by the host. The river roared across the unsuspecting land like an unleashed beast: a raging, untamed torrent, devouring all in its path. 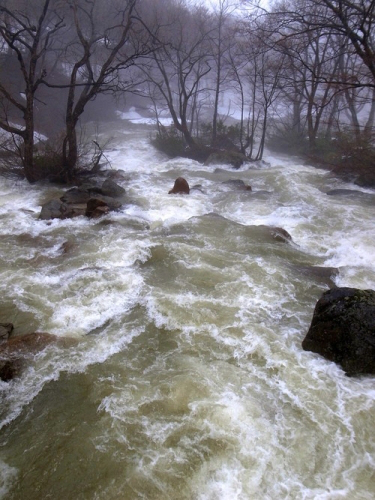 The mid-March air had lost its penetrating bite, snowmelt in the hills resulting in the river’s angry swell. Sweating after miles of rapid flight, Culann stared at the frothing water, the stepping stones engulfed by vengeful, swirling eddies. There was no possibility of him going back – nor was there any way of crossing. Panic surged and he bolted, ignoring the painful stitch in his side. As the gradient steepened the river plunged over a series of rock-strewn rapids, but beyond, the stream narrowed and became shallower, its flow less turbulent. Culann removed his shoes, tucked them under his arm and scrambled down the grassy bank. He waded in, gasping at the water’s glacial embrace, and headed slowly upstream. Sharp pebbles gashed his bared feet and after only thirty yards he could bear no more. He clambered up the opposite bank, careful to leave no indication on the grassy slope. The fat purse stolen from his brutal master sat comfortably at Culann’s belt. It ensured his passage home. And freedom: like that of the unleashed river. If you would like to read other entries click on the link here. A very dramatic scene you’ve set, with wonderful descriptions. Wow! Excellent Millie! I felt like I was right with him on his flight and through those rushing flood waters, heart pounding at the sound of the dogs. I think I even felt the sharp stones on the bottoms of my feet! I did REALLY like it!! It was great! Great story, Millie. 🙂 Beautiful descriptions. I hope Culann makes it home safely..
Ooh, the classic Fugitive approach, never even considered that one. Well done! The description is so well done Millie. It made me feel as I was a part of the scene. My eyes raced from the beginning till the end of the story. Wow, very powerful last line. So happy to have you join the prompt this week. Hope to see you back! Thank you, Ermilia. I hope to join in again next week.